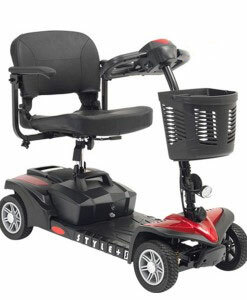 The Pride Pathrider ES10 mobility scooter delivers great outdoor stability, ease of use and maximum value. Features include a bright headlight, adjustable tiller, stylish design and an up to 18km range. SKU: S8547. Category: Mobility Scooters. The Pride Pathrider ES10 electric mobility travel scooter. This great design features a back-lit battery gauge, bright LED headlight and adjustable tiller. For added convenience it can be disassembled for storage or travel, and when it comes to comfort the ES10 has you covered, with a seat that features viscoelastic foam inserts for increased comfort and a slider for enhanced positioning. 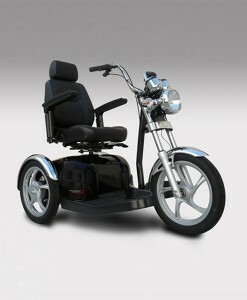 Can the Pride Pathrider ES10 be fitted with a high-back chair? What is the range of a fully-charged battery of the Pathrider ES10? You can go as far as 17.9km on a fully charged battery (but it may vary based on weight and road conditions). Can the Pathrider ESO10’s throttle be used with the right or left hand, or both? There are Throttle Control Levers on both sides of the tiller and can be used by both left and right hands.